Luxembourg’s finance minister has confirmed Alipay’s move to Luxembourg is imminent, Paperjam reports. The European payment subsidiary of the Chinese group Alibaba will soon establish its offices in Europe after receiving a licence for electronic payments from the Luxembourg authorities. The news about the integrated payment platform, with a customer base of one billion people, was tweeted by Pierre Gramegna during an official visit to Hong Kong on 14 January. It has been some years in the offing, with plans for a Luxembourg entity first announced in 2014. Alipay Europe will benefit from a European passport enabling it to operate within the European Union. It already holds a licence in the UK. Gramegna was quoted by Paperjam as saying that Alipay’s subsidiary in the grand duchy would strengthen ties between Europe and China. 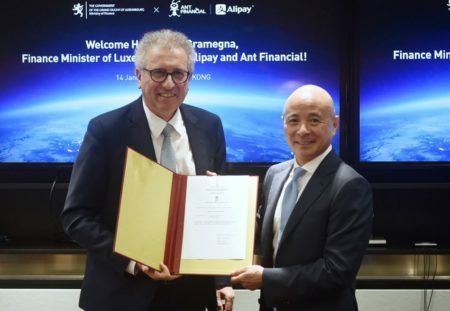 Minister of Finance Pierre Gramegna officially announced in presence of Chen Leiming, SVP and General Counsel of Ant Financial Services Group, that Alipay has been granted an e-money institution license in Luxembourg that will allow it to offer its services across the EU.